See this post for the GPS maps of Pinion Ridge with the lettered points. Here are the wildflower pictures I took. The one above is of cool lichen that grows everywhere on the rocks. The following picture shows the rocks at the edge of the ravine. Here are several wildflowers I found. I have a book that names lots of Colorado wildflowers, but I can’t identify a couple of these. I can't find an identification for these. 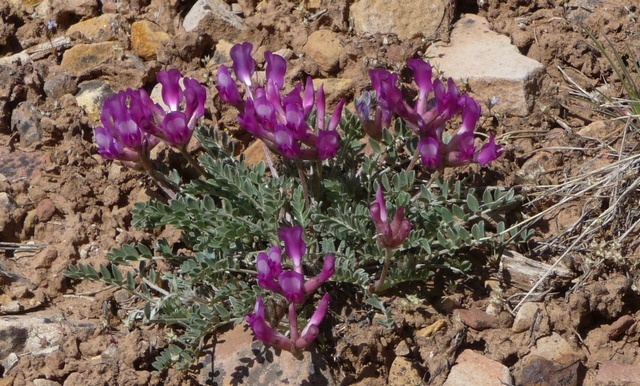 These little purple flowers, each about an inch long, almost appear as though they're succulents, although this is a pretty arid place. Dinky little blue flowers on Pinion Ridge. Each blossom is only a quarter-inch in diameter. I can't find any identification for these in my wildflower book. Small yellow wildflower on Pinion Ridge. The closest ID I can make is Whiskbroom Parsley, although the leaves aren't really developed enough to tell. I finish with this interesting view of lenticular clouds. The winds aloft must be blowing might fast! This entry was posted in Ouray County, Wildflowers and tagged lenticular clouds, orange paintbrush, Pinion Ridge. Bookmark the permalink.